Survival Heroes: Best Weapon In The Game? In the last post, we shared a complete guide with some evergreen tips, cheats & tricks, you can read that post here. In today’s post, we will talk about the weapons. Survival Heroes game features lots of weapons. And all the weapons have unique skills, stats, passive buff, range or attack area, advantages, disadvantages. For a newbie, it could be difficult to figure which weapon is best or which weapon is not. However, the game shows you a green arrow if there is a high-rank weapon available nearby. But it might not be good as it compares with the currently equipped weapon. That’s why you should hunt for supply chests, dragon chests, mystery shop items for the best weapon. But which weapon is best? Let’s dive in our today’s post. 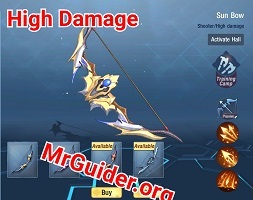 Before going deep into the weapon details, you must know that there are a number of factors depend on the attack power, defense power, mage power; for example; equipped items such as helmet, armor, pants, necklace. So make sure to equip the best item set to get the most out of the weapons. Additionally, you can reduce the cooldown time of the weapon’s skill by equipping binoculars. From the above words, we can say that only equipping the best weapon would not help. Let’s know why these are the best weapons. 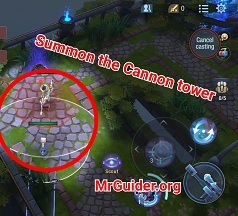 Cannon Tower Array – This is the best skill of this weapon. Unleashing this skill places the cannon tower on a certain point. You can place up to 2 cannon towers and these towers deal massive damage to the enemies. You get one cannon tower every 15 seconds. The player can save up to two towers to strike at a time. Another reason is it’s a long-range weapon with good damage. You should buy it. In the last moments, you can place the cannon tower for the enemy and increase the chances of getting the crown. Arrow Array – Casting the skill fires a rain of arrow and each hit to the enemy can reduce its HP by up to 26 points. Splitting Arrow – Unleashing this skill launches 6 arrows, can deal up to 120 damage upon hit. No doubt, skill charge time is too long. But the basic damage stats are good and using its skill at the right time can easily knock down the enemy as you will deal massive damage. 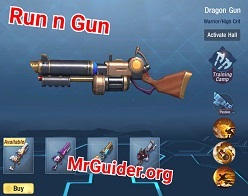 Dragon Gun is another powerful weapon in Survival Heroes game. With good attack range, attack power, and skills, it deserves to be in the best weapon list. Its skills can increase crit chances, help you in dodging the enemy attacks, and deal massive damage to the opponent. Steel Body – It’s a dash skill that pushes the character forward instantly. And it can also remove the control debuffs. You can use it to dodge the enemy attacks. Smoke Bomb – Unleash this skill to throw a bomb on the certain point(over the enemy). The smoke bomb lasts for 4 seconds and deals up to 95 damage to the enemy. Critical Gunplay – You can increase the critical hit chances, movement speed using this skill. The basic attack of this weapon is also good. Overall, a good weapon. 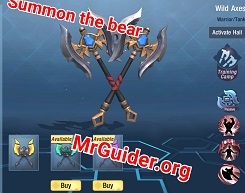 Summon – Using this skill, you can summon a large bear on the battleground. The bear also attacks the enemies. After summoning, tapping the same skill button heals or restores the health. But you will lose bear. It is one of the best ways to restore the health instantly. Enraged – Increases the attack speed, movement speed for 3 seconds. Spinning Axes – Unleashing this skill throws the spinning axes in the certain direction. You can save up to three axes to throw back-to-back every one second. You get one AXE every 10 seconds. Storm Hammers – Unleash this skill to deal 107 magic damage, 70% magic attack to the enemy. 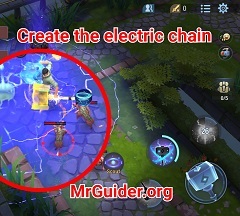 After unleashing this skill, your next main attack will create a deadly electric chain between enemies and restore your health. Lightning Hammer – By using this skill, you can trap the enemies in a thunderstorm, enemies in the thunderstorm would not be able to move and get up to 140 damage for 5 seconds. Wind Hammer – Inflicts the slow effect and deals magic damage to the enemy. You can unlock this weapon for 15000 gold. Orb is also a good weapon though(in replace of it). So that’s all about the Survival Heroes Best Weapon. However, it totally depends on how you use the weapon; skills, timing. And to get the most out of the weapons, reach the player level 10 in the battle. If you want to know more about the weapons, head to the armory -> select the weapon -> tap the training camp option.